Pastor Jeremy Husby delivers a sermon entitled “Jesus is Anointed to Fulfill the Scriptures” based on Luke 4:14-21 at Peace Lutheran Church in Hartford, Wisconsin. It was Jesus’ custom to go to the synagogue on the Sabbath Day. That didn’t start simply after his baptism in the River Jordan, his temptation in the wilderness that followed, or when he got back from the wedding at Cana. It was his custom from the 8th day of his life. At his circumcision, in some ways not unlike after a child is baptized today, Jesus was welcomed into the family of God and, after that ceremony, he was brought to weekly worship. However, even though it was his custom, there was something that made this Saturday’s worship attendance a little different. His presence at that particular place of worship was somewhat of a homecoming experience. He had been away—being baptized at the River Jordan, facing the devil’s temptations, attending a wedding and, after that first miracle, performing other miracles as well. In addition, news had been spreading about him lately. The Nazareth Daily Bugle, if it would have existed, would have had op eds written about the local boy who had turned into a countryside and countrywide phenomenon. People wanted to hear him preach and teach. They wanted to watch him perform signs and wonders. They just wanted to be around this captivating man. So, it is no surprise that when Jesus went back into the synagogue that he grew up inside, the people would want to hear what he had to say. Somewhat similarly to what is done in worship services today, prayers, songs, and readings from God’s Word were regular portions of the synagogue’s liturgy and order of service. And, after a few readings, there was time for a speaker to preach a message based on one of those readings. (If only we had kept the custom of sitting down to preach that message!) Either way, when the time came for that Sabbath’s sermon, Jesus stood up to read and sat down to preach. What would the local boy say? What applications could the carpenter’s son proclaim from Isaiah’s prophecy? In the verses that follow the Gospel reading appointed for today, it seems as though the people didn’t much care for his sermon. But it wasn’t because he still needed some seasoning in his presentation, like a seminary student who preaches the whole counsel of God with gestures and inflection that could use a little more experience. Nor was it because he had one of those sermons where he probably could have said amen 6 or 7 times already, but just said the same thing again and again. They certainly couldn’t have been upset about it being too long—it was only 8 words! No, the reason they didn’t much care for his prepared remarks was because, in those 8 words, he was claiming to be something special and something for which they had been waiting so long to see. 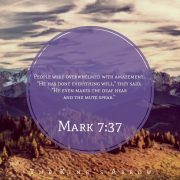 In fact, their waiting was so long that their impression of how those scriptures would be fulfilled had gathered some extra expectations that Jesus certainly wasn’t living up to. They wanted a king. They wanted political freedom. They wanted someone to sit, not on a synagogue chair, but on a golden throne in an ornate castle and spread the borders of his kingdom with actions, not simply with words. Is that what you want in your Jesus? Someone who isn’t only going to speak, but is going to act? Someone who will fill your bank account. Someone who will turn this corrupt democracy into a productive theocracy. Someone who will support you when you do what feels right to you. Someone who will take action against the terrorists and those zealots who kill and destroy in the name of false gods. Like the people of Nazareth, there are times when the expectations of who Jesus, the Christ, should be overshadow exactly who God told you he would be. Instead, rather than looking for signs and wonders, listen to him. Listen again to Jesus’ short sermonette: Today this Scripture is fulfilled in your hearing. The one who fulfills the Scriptures did so, and does so, for you through what you hear. The work Jesus was anointed to accomplish, according to the prophecy of Isaiah, doesn’t have anything to do with your bank account, corrupt politicians, or terrorists. It didn’t deal with the Messiah, the Christ, that people wanted, but the one that they, and all people, including you and me, needed. Friends, you were poor; not because your savings couldn’t support your daily physical needs, but because you were lacking the wealth of the riches stored up for you in heaven. You, too, were captives; not because you can’t get your governmental representatives to pass laws against abortion or in support of your personal political platform, but because you had a master who enslaved you and forced you to act in contrast to what your conscience told you was right. However, though your conscience protested, it is not as though your slave-master, the devil, had to whip you into submission to serve him in sin. Many times, all he had to do was suggest something enticing to your own sinful nature—a nature that was blinded from seeing the difference between selfishness and selflessness. You were oppressed by the devil, this world around you, and your own sinful nature, which kept you in the state of being a poor prisoner, without any hope of seeing the light of God’s truth. And, while you were looking, either for ways to continue down the road of death and destruction, or to take the high road of enlightenment, one day, either quite recently or many years ago, the scriptures that testified about Jesus were fulfilled in your hearing. Someone, somewhere, at some time, came to you in the power of the Spirit. 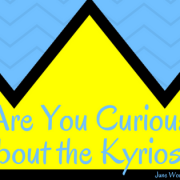 Whether their preaching was a 35 minute sermon delivered rather awkwardly or a quick whisper which wrought welcome relief in your time of woe, it was dynamic; not because of what you saw or felt, but because of what you heard. It may have been attached to the waters of your baptism, taught to you in a Sunday School classroom, sung into your heart by your mother while you cuddled in her warm embrace, or heard in Steinbrenner’s sermon last Sunday, but either way, anyway it was preached, it was powerful because, through it, the Spirit that was on Jesus (v. 14) then went to work in you. That good news brought the wealth of salvation to your poor soul, freed you from your enslavement to sin, by opening your eyes to see Jesus as the only way to heaven. The power of the Spirit, sent through the Word that you heard, convinced your heart to trust that Jesus’ perfect life was lived in your place and that his atoning sacrifice was made to bring you at one with your creator. The power of the Spirit, sent through the Word that you heard, produced faith in your heart that unlocked Jesus as the fulfillment of all of the Scriptures. Sinful assumptions and expectations are removed and your ears have heard how Jesus is your Messiah and Christ, the same One who was promised to Eve and Adam, Abraham, Isaac, and Jacob, and that, because of what he has done for you, the Lord’s favor rests upon you year after year. Whether you’ve been spending your time away in foreign lands, facing the temptations of the Devil, or attending weddings, make it your custom to come back to your home church week after week to hear his proclamation to you. 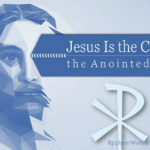 Jesus was anointed to fulfill the Scriptures and he did, for you and for all. Amen.